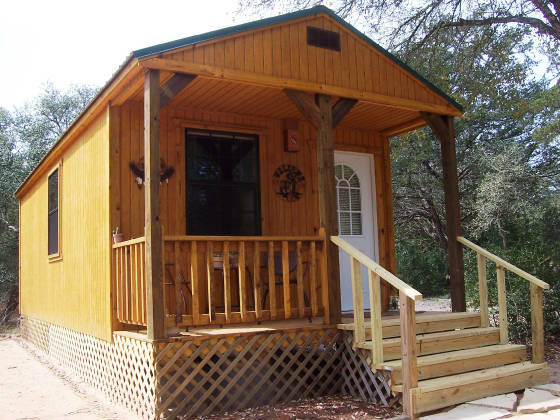 Our newest addition to Trails West Retreat is our Trails End Cabin. 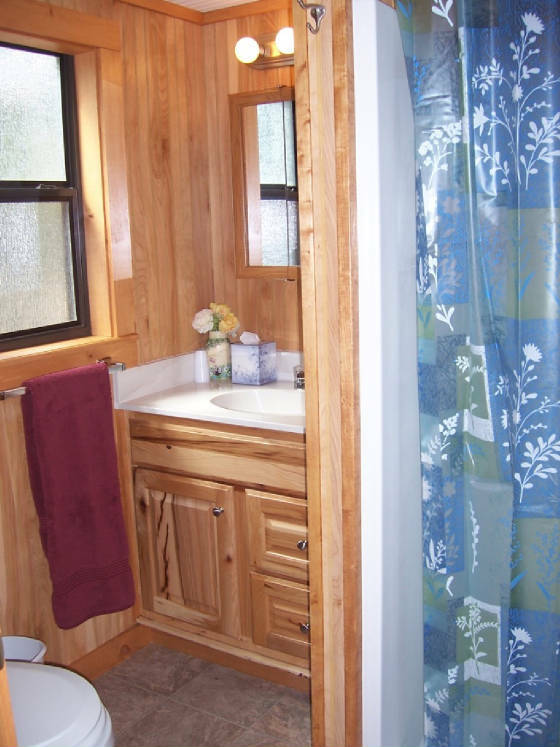 It features a queen bed and double futon, fridge, microwave, coffeemaker and showerbath. 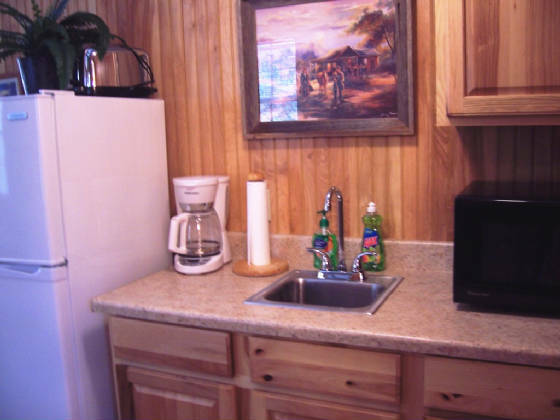 A flat screen TV, Free Wifi, Direct TV, AC/heat, towels, dishes, utensils and linens are furnished. 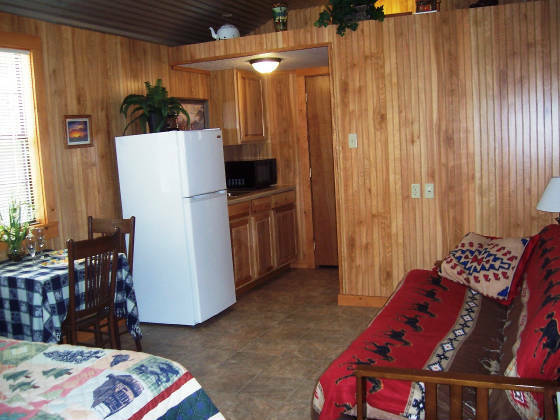 In addition, for your pleasure are a large deck with table and chairs plus a bbq grill. Pricing: Off Season: $120 weekend dbl occpy + tax. Please add $20 per person over 2 inc tax. Add $10 extra for one night stays. Sorry, no one night stays for holidays or Antique shows. $110 Sun-Thurs except for holidays and special occasions. Holidays $135, Antique Shows $140. 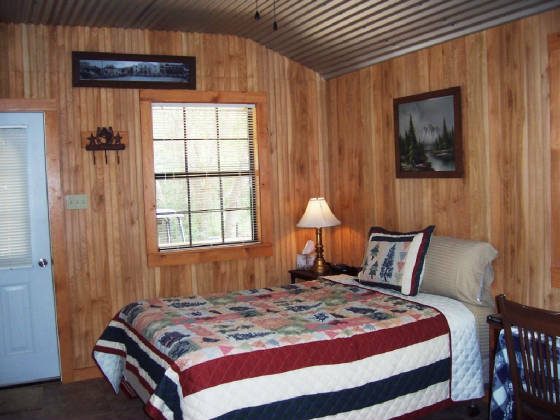 (Two night minimum) We accept only 3 night bookings prior to 3 months before Antique shows. Deposits for Antique shows are half down in advance. Custom built for Trails West Retreat off-site. Del did all the interior finish work. 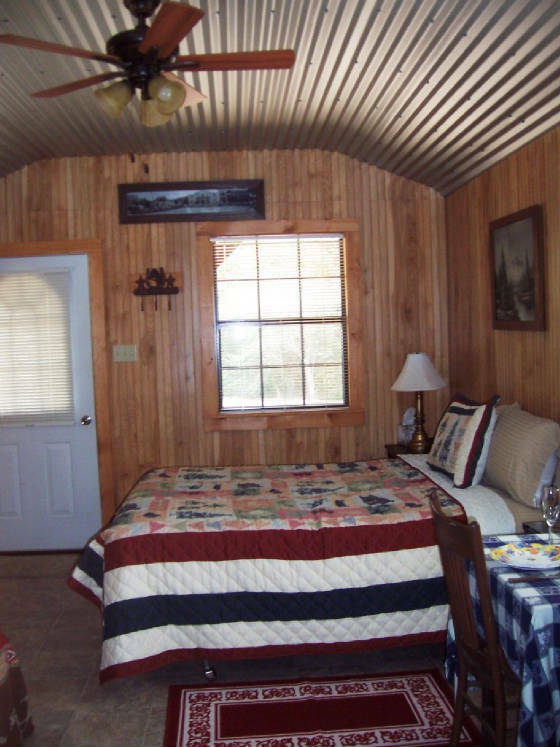 It has beadboard paneling and tin ceiling with ceiling fan, AC/Heat, queen bed and a futon with a Texas/western motif theme. 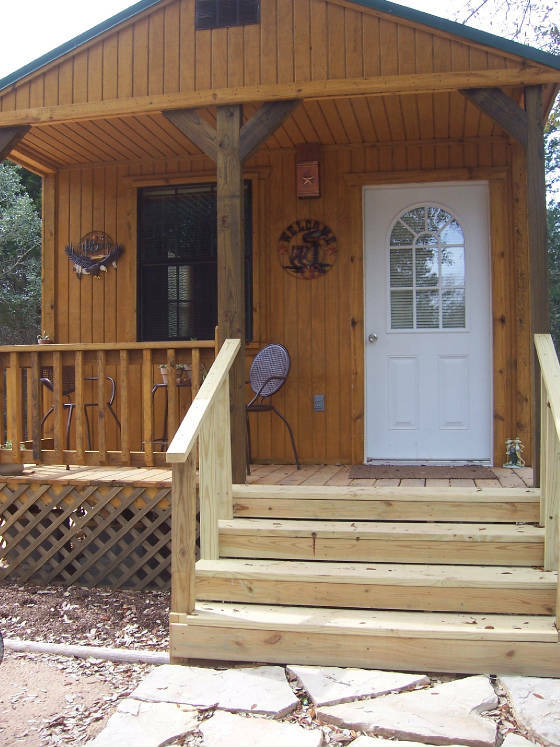 We think it is one of our cutest cabins. It is right next to the Cottage and can be rented at a reduced price in conjunction with Cottage rental. A large deck extends out on the right side of the cabin with a pretty view of the woods. Missing from this picture is a flat screen TV on the wall opposite the refrigerator. If you have Netflix movies on your Ipad or computer, there are hookups on the TV to view them and we have a DVD player available for movies which you may check out from our video library at the Lodge. We do have free WIFI available too. Direct TV with many different channels is available. Trails End Cabin truly gives you the feel of being in Texas and the Old West which is the theme of many of Betty's books. Speaking of books, Betty's newest book, Trails West III: The Republic of Texas & Beyond, The Captain's Story has just been published October 2014 and available both from Betty and Amazon.